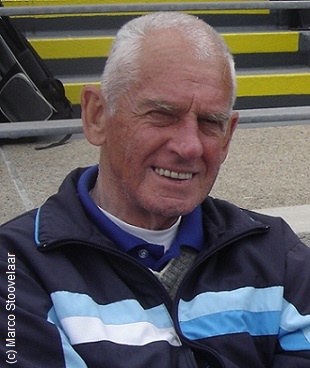 Former national softball team coach in the Netherlands, Spain and Belgium, Arnoldus Simon Houtkamp died at the age of 89 on February 22 and was buried on February 28 after a farewell ceremony attended by 150 persons. On behalf of Royal Netherlands Baseball Softball Federation KNBSB, managing director Bart Volkerijk expressed gratitude and respect for Nol Houtkamp’s life time coaching activities for clubs and national teams in and outside the Netherlands. Also former KNBSB president Ruud van Zetten and new ESF Director of Umpires Carolien Stadhouders attended the ceremony at Algemene Begraafplaats Bloemendaal last Wednesday morning. Nol Houtkamp (born 30 November 1928) started a successful baseball career as left handed pitcher and outfielder with four Hoofdklasse clubs (RCH Heemstede, Kinheim and EHS in Haarlem and ABC in Amsterdam) and in Netherlands national team (24 caps, European Champion 1957 Mannheim, 1958 Amsterdam, 1960 Barcelona and 1962 Amsterdam). In Detroit USA 1957 Houtkamp belonged to Netherlands national team participating in Global World Series, representing Europe as continental champion. In Haarlem NL 1961 he appeared as national team player in first ever Haarlem Honkbal Week. With EHS in 1959 and 1962 Houtkamp clinched national club championship in the Netherlands. As from 1969 till 1983, Nol Houtkamp was manager for Netherlands national ladies softball team, totalizing a still reigning record long 15 seasons of management. First ever participation in World Championship: Stratford USA 1974. First ever held European Championship was in 1979, followed by next editions in 1981 and 1983, all continental titles won by the Netherlands. As manager of Belgian national team, Houtkamp stunned in European Championship 1990 at Genova Italy by beating the Netherlands 1-0 and by finishing second after the Netherlands and before Italy. Houtkamp was inducted for ISF Hall of Fame in 1983 and for ESF Hall of Fame in 1991. In 2007, the new softball complex run by Olympia Haarlem was named after Nol Houtkamp and he threw the ceremonial first pitch for 2014 ISF World Cup tournament hosted by this club for 16 national teams.